Naming a company after a bird renowned for its inability to adapt seems an odd choice, especially when that company is Dodo. When Dodo came on the scene in late 2001 as a shockingly budget dial-up ISP, many had to ask- What’s the catch? When Vodafone dipped their toes into the deep waters of wholesale mobile networks in 2004, Dodo jumped right in. Their prices were so low that many supposed that the company was a buyout target. They would build up a massive user-base, run out of money, and then go a-courting for a suitor to buy them AND their inflated customer spreadsheet. Yet here we are, 10 years after their debut, and Dodo is still deep in the game of providing telecommunications service anywhere they can. Their run hasn’t come without a few knocks. In 2007, Dodo topped the tables for complaints to the Telecommunications Industry Ombudsman (TIO), despite owning less than 3% of the market. Their complaint numbers at the time doubled those of Telstra, which owned slightly over 50% of the market. Something was very wrong. Dodo founder and CEO Larry Kestelman immediately set about restructuring the company, to focus on customer service. Currently, about 80% of Dodo’s customer service team of 900 is outsourced to the Phillipines, with 20% based in Australia. Thanks to updates in network equipment and a further focus on improving call wait times, Dodo now enjoys a 6th place finish in the latest TIO complaints table from 4th Quarter 2011, more commensurate with their market share. Roy Morgan Research runs an annual poll of top Australian ISPs, rating customer service and support. Dodo pulled a 63% satisfaction rating to 1st quarter 2012, placing it well behind its immediate competition for low-cost broadband, TPG (80%) but not that far behind Telstra BigPond (72%), which now receives more than its fair share of complaints. While 63% places it down the bottom of the pack, this is a clear indication that Dodo is doing something right. All they need to do is stay on course. Dodo now offers a full range of Broadband services – ADSL, ADSL2, Mobile Broadband and Naked Broadband. Where they previously came under fire for offering overly complicated plans with hidden costs, they now have a pared-down billing structure that brings more clarity. Dodo has continued to aggressively innovate, offering power services and soon, gas. Dodo is aiming to become a one-stop shop for all household utilities, with broadband and mobile quickly becoming as important as other services. Dodo offers a 20% discount to customers who pay their utility bills on time, incentivizing a practice that saves utility companies hundreds of millions of dollars every year. Nevertheless, past problems still pervade Dodo’s public image, which is hardly improved with advertising that that tries a little too hard to be cool, and running “Dodo-Girl” competitions. But looking past these quirks, it’s hard to deny that Dodo is one of Telstra’s best providers for offering cheap, nationwide connections. With the National Broadband Network (NBN) getting closer to reality every day, expect Dodo to be an eager participant, offering equally fast broadband as everyone else, but with a reputation for finding a way to make it cheaper. 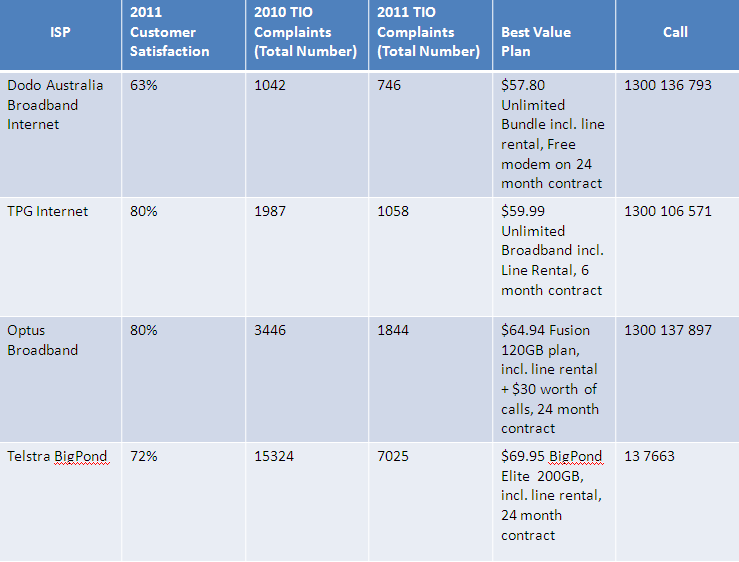 Here's a quick comparison of how Dodo's broadband internet services compares with other service providers. Click to see Dodo broadband plans,or call Dodo on 1300 136 793 for more details on plans and availability in your area.